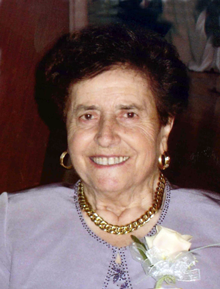 Moscaritolo, Maria G. (Carpenito) of Revere formerly of East Boston passed away peacefully on April 1, 2019 surrounded by her loving family. Beloved wife of 80 years to the late Angelo Michele Moscaritolo. Loving mother of Vincenzo Moscaritolo and his companion Lucy Leone as well as his late wife Teresa of Revere, Teresa Buonopane and her husband Mario of Medford and Silvana Leno and her husband Henry of Revere. Dear sister of the late Regina Picariello. Also survived by 6 loving grandchildren and 6 loving great grand children. Family and friends will honor Maria's life by gathering on Thursday April 4, 2019 from 4-8 pm in the Ruggiero Family Memorial Home 971 Saratoga St. (Orient Heights) EAST BOSTON and again at 8:45 am on Friday morning before leaving in funeral procession to St. Anthony of Padua Church 250 Revere St. Revere for a funeral mass in celebration of Maria's life at 10 am. Services will conclude with Maria being laid to rest in the Holy Cross Cemetery Mausoleum, Malden.